As an artist, I feel that art can be accessible to anyone. Just as anyone can learn to do arithmetic or write an essay, art is half technique, half creativity. We can all be creative if we just think outside the box. It is not my goal to make Picassos out of each student; instead, my goal is to help students understand the language of art and learn to problem solve creatively. As a self proclaimed 'techie', I love that technology can be extremely user friendly for the novice, and entertainingly challenging for the advanced. I often combine my artistic and technical skills. My classes will teach students to become comfortable in today's technology world and to provide them with skills that will help them in the future job market. I was born and raised in Tucson, Arizona. I began drawing at a young age but it wasn't until I was in high school that I encountered an art teacher who would be my mentor for the next four years. It was because of her that I decided to become an art teacher, and it was a honor to complete my student teaching with her. I graduated from the University of Arizona in 2001 with a Bachelor of Fine Arts in Art Education with an emphasis in oil painting. It was while I was in college that I gained knowledge also in computers as well as web design and graphic design. I designed web pages as a way to make extra income as a college student. I have designed logos for many companies and non-profit organizations as well as designed programs and flyers. In the fall of 2002, I began my teaching career at Estrella High School, a sister school to Peoria Accelerated. Through my years at EHS, I had the opportunity to teach Intro and Advanced Art, Art History, Photoshop, and Web Design. I was also the webmaster for EHS and was a part of the initial process of creation. In partnership with the West Valley Arts Council, I took several advanced students with me to paint two public murals with local artist Bryan Kilgore. 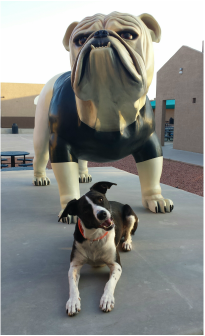 One is located in the Goodyear Fire Administrative Office, and the other is located in on the alley wall north of Estrella High School, which was created as a graffiti deterrent. After 10 years of teaching, I had the opportunity to move to Peoria Accelerated High School to teach under the direction of Mr. Englund. In addition to teaching, I am very active in the community where I live. I have been a member of the Surprise Arts and Cultural Advisory Commission since April 2011 and am currently serving as Vice Chair. I am a member and webmaster of WHAM (What's Happen'n Art Movement) Art Association since 2012, as well as a member of the West Valley Arts Council since 2011. I am a painter and photographer. In college, I was a member of CARBON BASE Gallery and took part in several exhibits as well as a collaborative mural project in the Tucson Child Advocacy Center. At had several paintings hanging in the Arizona House of Representatives building. Despite all of my extracurricular activities, teaching is my number one priority. I enjoy watching my students grow and seeing students who were once intimidated by art and technology leave my classroom with a greater appreciation for both. This year I'm excited to be able to start an Art Club and hope to continue the tradition of excellence in the Media Production class. In my free time, I enjoy going to art openings and art festivals, taking my dog Bella (pictured above) to go running or showing her new tricks, and experimenting with new art forms.